Manage your patch libraries for the VL1 and VL1m synths. 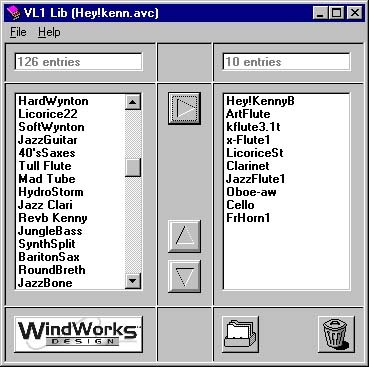 The VL1-LIB program is a software librarian tool to assist in the management of voice files (patches) used with Yamaha's VL1 Synthesizer. The VL1-LIB librarian allows the creation of files used in the VL1 and VL1-m synthesizers. The program will allow you to select any voices from any input source (.1vc, .1bk, .avc) and copy them into a destination file. The librarian utilizes a graphical user interface, incorporating simple "highlight and move" type file manipulation. The voice selection follows most window-type conventions, including multiple selections through ctrl-click and shift-click functions. The interface also supports ASCII sorting of the destination list, as well as promotion and demotion file sorting, plus deletion. When voice selection is complete, the destination list is written to a single file, with the program automatically determining if the file will be .1vc format (a single voice was selected), .1bk format (2 to 16 voices were selected), or .avc (17 or more voices were selected). The written file can be to a floppy for direct loading into a VL1, or to a file on another drive for future use or library cataloging.